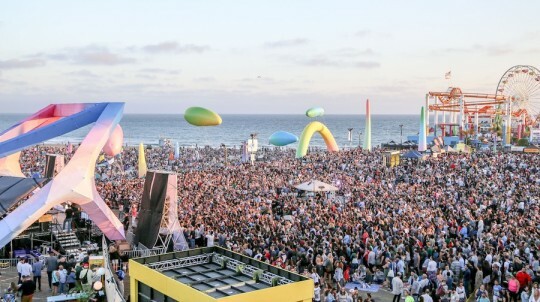 Thursday, June 22, marked the return of Santa Monica’s annual Twilight Concert Series, and with it came their largest show to date. Opening the Twilight Concert Series were neo-soul artists Khalid and Bibi Bourelly. The two would not grace the prolific Santa Monica Pier stage until later in the evening, but that did not stop the most devoted of fans from camping out on the pier as early as 10 a.m. Crowds surged and pulsated with a sense of revelry and anticipation for what was bound to be a remarkable night of rock-filled soul. As far as the eye could see, the beach surrounding the pier was filled with eager and pleased fans–it was as if, for a night, Santa Monica had been transformed into Woodstock ‘69. Bibi Bourelly was the first to take to the stage. The singer/songwriter who gained notable attention from an early age for writing songs for artists like Rihanna, Kanye West, and Usher proved that she was a notable performer as well. Bourelly’s clear familiarity with songwriting infused every moment of her performance, as she transformed her own songs into a live experience that was something entirely new. From instilling her soul music with a backing rock band to create an intense surge of emotion, to intermixing covers of songs, such as Gavin DeGraw’s “I Don’t Want to Be” and Anna Nalick’s “Breathe,” with her own songs, every moment of her performance had the crowd in a fervor over what unexpected moment was to follow. 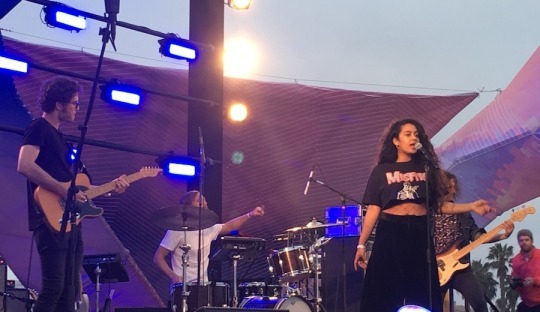 Bourelly left the stage in very much the same way she controlled it – in rock and roll fashion – thanking the crowd and exiting while her band continued on in a heavy jam session. Moments before Khalid took the stage, there was a palpable change in the air. People rushed from the back of the pier vying to get the best possible view, a girl leaped over the confines of a nearby seafood restaurant to make a mad dash for the stage, even we dropped everything we were doing to make sure we would not miss a single moment. 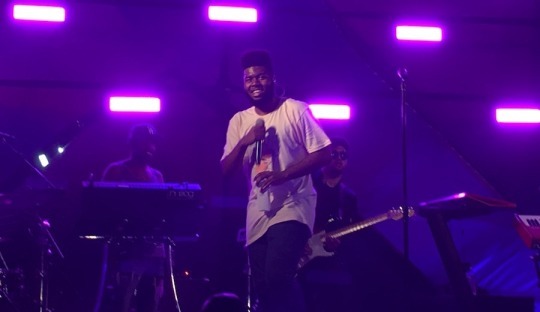 Khalid took the stage to deafening fanfare and riotous applause from the crowd, and it was immediately made clear why and how the soon-to-be star brought out nearly 60,000 fans who were willing to camp out for a glimpse of his performance. Khalid seemed to be a natural performer, sure to never neglect an inch of the crowd, managing the difficult feat of performing both to the pier and the tens of thousands camped out on the beach. Most of all, Khalid brought an air of enthusiastic passion to his performance, dancing around the stage breaking for air-guitar solos and providing light-hearted commentary between songs. The highlight of the performance was Khalid performing a cover of Frank Ocean’s “Lost” to an absolutely entranced crowd before delivering his hit single, “Location.” Khalid’s performance was one that will likely go down in memory for all of those in attendance. The Twilight Concert Series continues through the summer and features performances from LeMaitre, Coast Modern, Miami Horror, Cleopold, Warpaint, and more–see details here. June 19, 2018 Momoji and Rain exquisitely touch upon the deep emotional balance that makes life what is.